As I mentioned in my previous blog about training to become a Thermomix consultant I got the news that my TM5 has arrived during my last day of training. I was so excited!!! If you’re a Thermomix owner then you know the excitement I’m talking about. 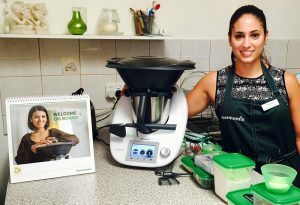 I was so excited that my Thermomix had arrived that I went to pick it up from my consultant’s house after I finished training. This is not what normally happens but my consultant had commitments that night so we arranged for me to get my delivery briefing at her house. This delivery briefing is very important and runs you through the basics of how to use your Thermomix. During the briefing you also make the vegetable stock paste from the Basic Cookbook (BCB) together. This is the first thing you make not just because it uses the main functions of the machine but also because the veggie stock paste is in a lot of the main recipes. It’s like liquid gold – it adds so much flavor to your meals! Once the delivery briefing was over (about an hour) I headed home with my precious cargo. Dinner was already cooking but I needed to cook something with my Thermomix, now that I finally had it! After setting up my TM5 on the bench in its new home I saw the asparagus sitting on the bench. Yay! I had something to cook. I opened my BCB and flicked to the quick guide for steaming. 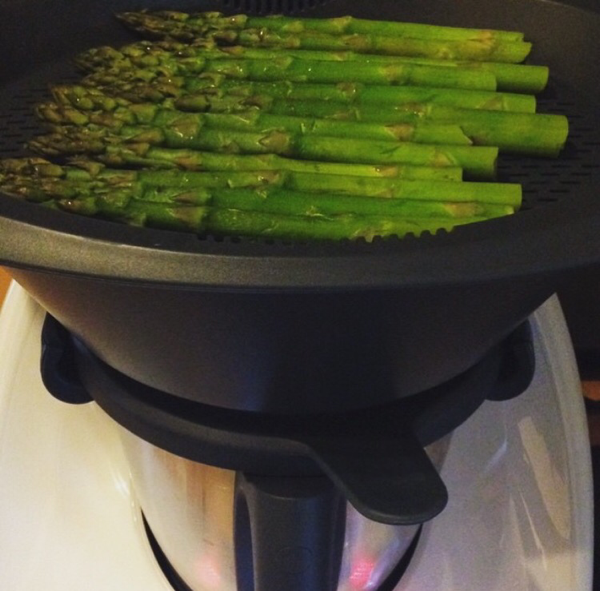 Then I popped the asparagus in the Varoma, sat it on the Thermomix and was cooking my first dish! Not as glamourous as I had thought it would be lol! And definitely not the Nutella I had written as my answer to ‘what would you make first’ question on my feedback form at the demo! What was the first thing you made in your Thermomix?